Two adorable fluff balls are the subject of this pet portrait: Huney Bear and Ginger. 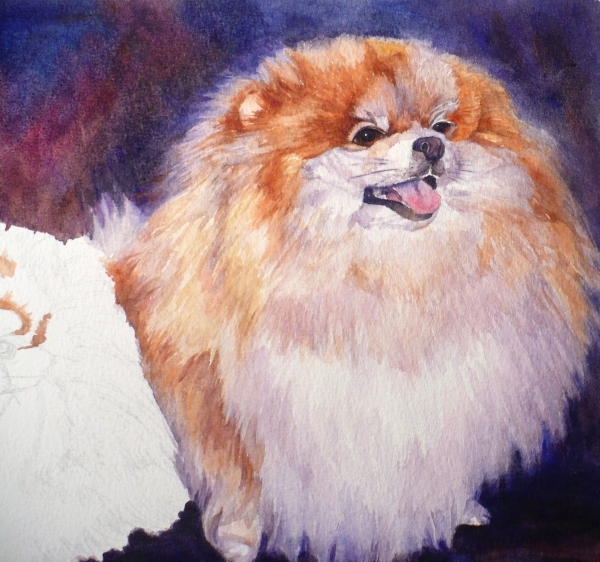 I've drawn these two Pomeranians on the watercolor paper adding as much detail as I can. 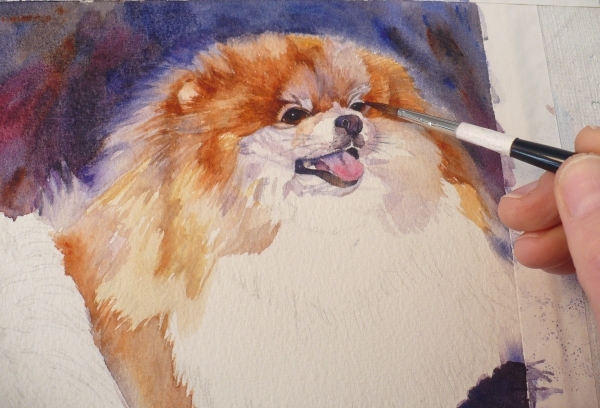 I'll begin by painting the background. 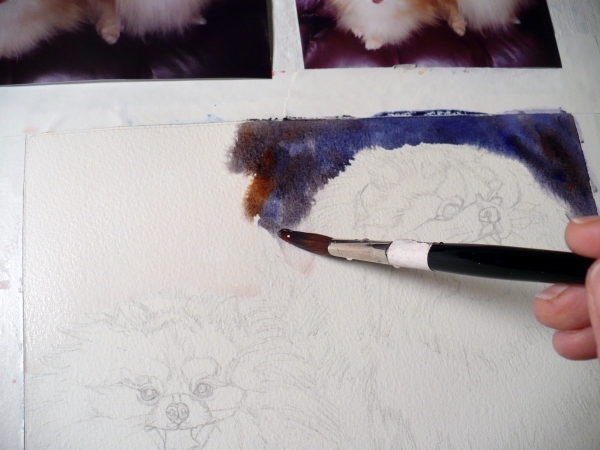 The dogs are a light color, so I paint the background dark to make them show up well. 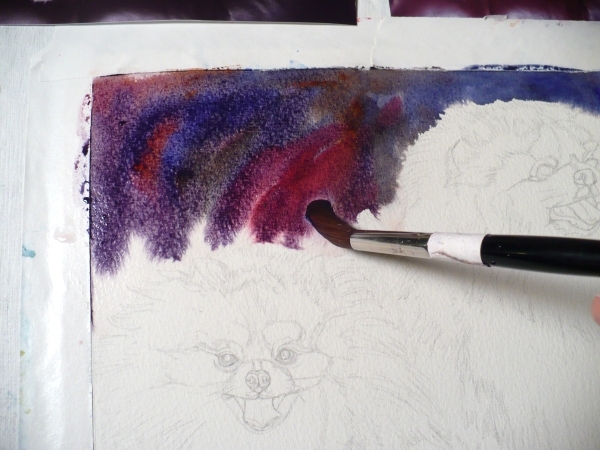 First I wet the background with plain water, then use blue, rust and rose paint letting the colors mix on the paper. This will make a more interesting area than if I'd just painted with a flat dark color. I'll probably do another transparent wash over parts of it when it's dry to even out the colors a bit. Huney Bear is first up! He is the boy dog and the larger of the two. 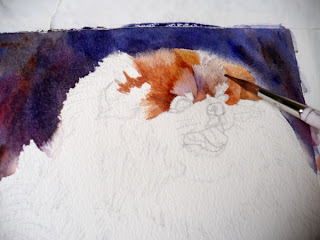 I'm using the exact same colors that I used in the background to paint his fur: rust, blue and rose with the addition of a pale sandy yellow called raw sienna. Once facial features are painted in, the portrait really begins to come to life! You can click any of the pictures to see them larger. Since these dogs are so fluffy, I want that furry quality to come across in this painting. There are several ways to create a soft, fuzzy impression with watercolor. In this case, I use wet-into-wet technique. I wet an area near the outside edge of the dog and then pull some of the dark background color into it adding additional color as needed. This will eliminate the "hard" edges and give the impression of fur. Check the picture below to see how this looks. Here's Huney Bear! The coloring around his head is a bit too red, so I'll work on adjusting the tones and begin working on Ginger's portrait too. 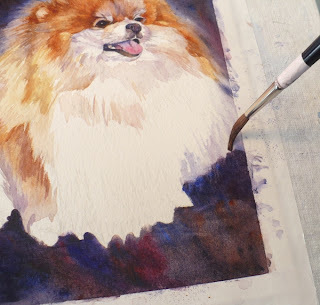 Click here to see the rest of the Pomeranian dogs watercolor demonstration. Thanks for stopping by today. To see more of my pet portraits, visit ZehPetPortraits.com. Thank you Joni! I appreciate the encouragement.